On this step you should locate a previously made backup file you want to restore from. Then you should specify which Outlook items to restore. Figure 16. What to restore. To locate the backup file you want to restore from use Select backup file dialog (Figure 16; Pos 1.). To see the backup file description (if any) click on Storage item, description will appear in Description area (Figure 16; Pos 3.). 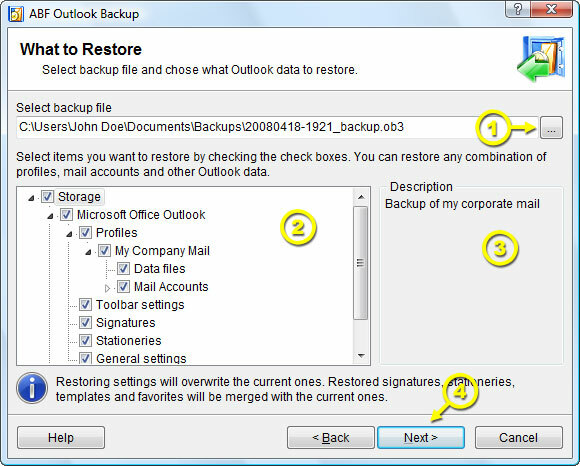 Choose Outlook items you want to restore from this backup file (Figure 16; Pos 2.) and click Next (Figure 16; Pos 4.) to proceed to the next step.